Sorry, Pittaki Street is permanently closed. 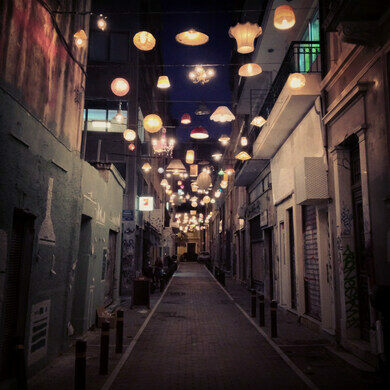 Before 2012, Pittaki Street was an industrial alleyway that pedestrians avoided at all costs. Though Psyrri is a lively neighborhood, the streets surrounding Pittaki Street were filled mostly with warehouses and industrial sites. The alley was occasionally referred to as a public toilet. The oldest cemetery of modern-day Athens blends the modern and ancient worlds. 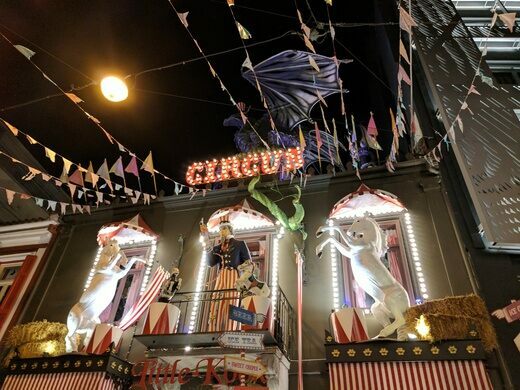 That all changed when the non-profit Imagine the City and the creative lighting studio Beforelight teamed up to give Pittaki Street a makeover. 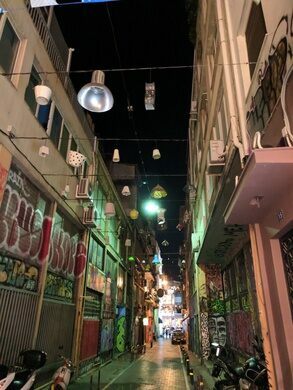 In order to restore foot traffic to the neighborhood, they collected unused light fixtures from all over Athens to cast light into the shadows of the grimy little alleyway. 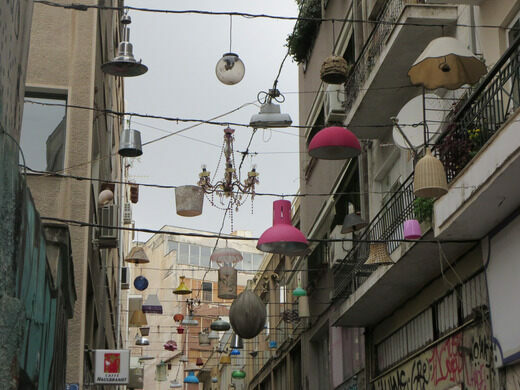 Athenians volunteered lights of all kinds, which reflected the city’s multicultural identity in their variety. Midcentury metal lamps, Chinese paper lanterns, 1940s floral and fringed lampshades, stained glass lamps, Moroccan mirrored shades, and the requisite Ikea lamps were all donated to the project. Volunteers painted the alley in soft pastels, with homey scenes of kitchen and living room furniture and on a rainy evening in November of 2012 the lights were turned on. 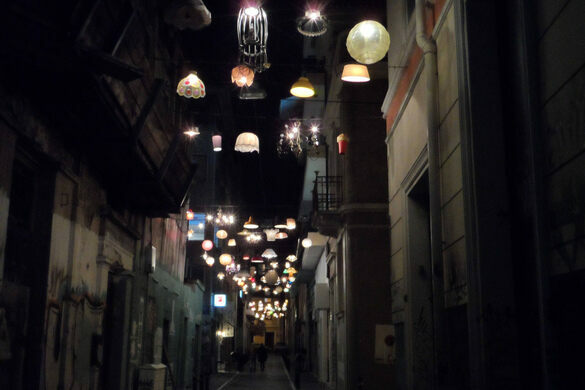 The hodgepodge of lamps cast a glow across the formerly gloomy Pittaki Street. 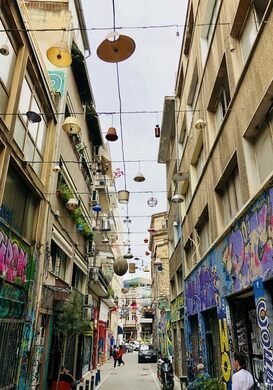 Since then, the alley has become a cheery hub of Psyrri. 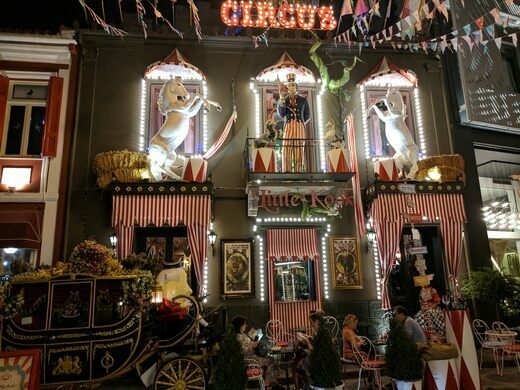 People walk through it regularly, pose for photos, and there are even events staged there. Boutiques that failed on busier streets thrive here thanks to the heavy foot traffic. 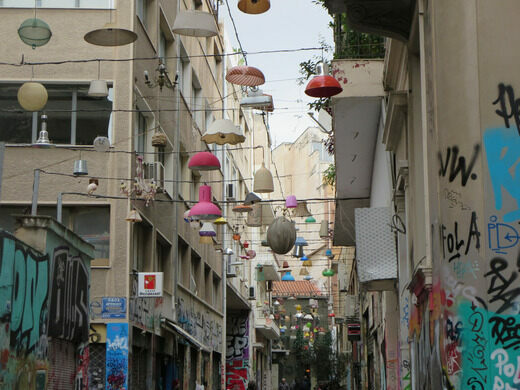 Pittaki Street has gone from Athens’ toilet to its living room. 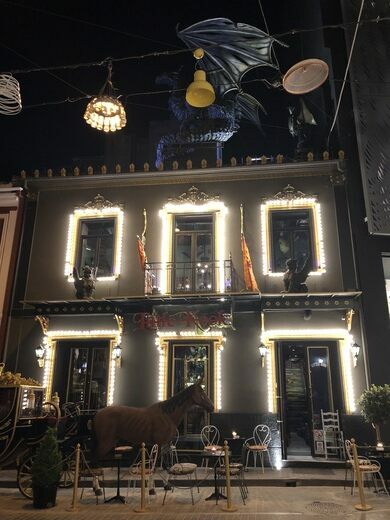 As of April 2019, almost all of the lamps are gone.